Olivia’s symptoms began in early 2011 with headaches and vomiting about once a month. The doctor diagnosed this as migraines. Sometimes these were followed by a few days of a feeling of pressure in her head and being unsteady and tripping up, but this always resolved within a few days. We took Olivia to the opticians and she was found to have normal vision in both eyes. This carried on until July 2011. Now Olivia’s eyelids were puffy and her eyes were only half open – some days were better than others. The doctor diagnosed this as hay fever. The headaches continued until August 2011 when Olivia had a severe headache with vomiting, lasting five days. Olivia was now unable to lie flat and was vomiting, or nauseous, most mornings. Olivia kept getting a sensation – which we later found out was pressure in her head – which she described as ‘feeling like she was going to die’. We called NHS Direct and they diagnosed a sickness bug. It was now early September and Olivia was not getting any better. We took another trip to the doctors and listed all Olivia’s symptoms: headaches once a month, daily nausea and vomiting with inability to lie flat, excessive thirst, going to the toilet a lot, weight loss, droopy eyelids, and a feeling like she was going to die. This time acid reflux was diagnosed and treatment given for that. Over the next few weeks Olivia got worse. There were lots of trips and phone calls to the GP and a referral was made to a paediatric gastroenterologist. The appointment was for a few months’ time. After a bad night with Olivia being sick I was desperate for something to be done. She had also developed a squint. On 3 October 2011 I decided to take Olivia to A & E and was going to refuse to leave until something was done for her. The triage nurse was very rude – after taking Olivia’s history she asked why we were there when a referral had already been made. I replied: “Look at her. She’s afraid to eat because it makes her feel sick”. The doctor thoroughly examined her and asked if it was normal for one of Olivia s pupils to be larger. It wasn’t. She wrote up her notes then excused herself to ‘go and consult her text books’. She returned explaining that Olivia was to be admitted that day for an MRI of her head. We went to the children’s ward in a daze and shortly later Olivia went for the scan. She was unable to lie still for long so the scan took quite a while. Olivia had to be taken in and out of the scanner to be sick. A few hours later, after being given IV anti-sickness medicine, Olivia was in the scanner again, which she tolerated slightly better. That evening, once Olivia had settled to sleep, our whole world came crashing down. We were taken into a side room to be told Olivia had a lesion in her brain which was most likely a tumour. We were transferred early the next morning to the neurosurgery ward at Alder Hey where we were met by a consultant who had booked Olivia for a biopsy the next day. We were always honest with Olivia, and she was amazing throughout, never complaining. The biopsy showed Olivia had a large, deep-seated inoperable grade 2 oligodendroglioma. Olivia was to receive a high-grade treatment protocol. But the aim of treatment was cure. 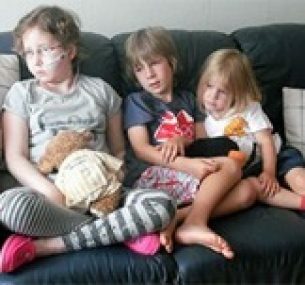 They aimed to ‘switch off’ the tumour and cure Olivia. We were made aware that the tumour would always be there. Olivia had a mask made for her six weeks of weekday radiotherapy. Alongside this Olivia was to have daily oral chemotherapy then a further 12 months of chemotherapy on a 28 day cycle – five days on and 22 off. The radiotherapy went well with Olivia only having minimal side effects of hair loss, and some skin irritation and nausea. Two days into the radiotherapy it was decided to insert a Ventricular Catheter (VP) shunt. This made a huge difference to Olivia’s vision which we hadn’t realised was so bad. She came round from the anaesthetic and her first words were ‘wow, I can see’. 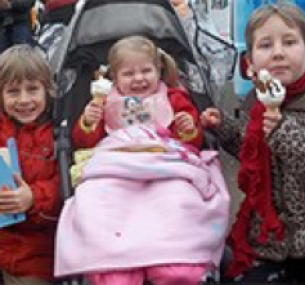 The radiotherapy continued and Olivia managed afternoons in school with her friends. She never once complained despite the mask getting so tight (due to the weight gain caused by steroids) that it left dents in her skin. Olivia had a break in treatment following the radiotherapy and restarted oral chemotherapy, in the form of temozolamide, at the beginning of January 2012. She coped with this amazingly well once her sickness was brought under control. Again, she spent most days at school. Three-monthly scans showed no change in the lesion. Things continued much the same until the end of May 2012. Then we noticed Olivia having episodes where she would wander off, grasping with her hands and being unresponsive, followed by a strange taste in her mouth. This was diagnosed as focal epilepsy and numerous medications were tried to control it. Unfortunately this failed to bring the seizures under control, with Olivia having up to eight seizures per day. In October 2012 it was decided to list Olivia for a right temporal lobectomy. In order to control the seizures they would remove the part of Olivia’s brain causing them. This was performed on 20 November 2012. Olivia again faced this with the strength and determination she had shown throughout her treatment. She skipped into the anaesthetist’s room knowing she was going to be in theatre for at least eight hours. We kept ourselves busy with our two other children and ten hours later Olivia came out of theatre connected to various monitors and was catheterised. Again, in true form, within two days Olivia was disconnected from all the monitors and walking around the ward. Just two days later, only four days after surgery, Olivia was discharged. Unfortunately two days after that she was re-admitted as an emergency. She was confused, lethargic, having hallucinations and her right eye was deviating. She was treated with ten days of IV antibiotics for suspected meningitis. This was her longest hospital stay. The histology results from the lobectomy were very disappointing, showing active tumour with foci of anaplasia. After discussions with specialists around the country it was decided to start Olivia on a new treatment regime which would require her to have a central line. This was inserted in January 2013. Olivia starting PCV chemotherapy shortly after. Again, the aim of this treatment was cure. Olivia managed well on this treatment with few side effects. 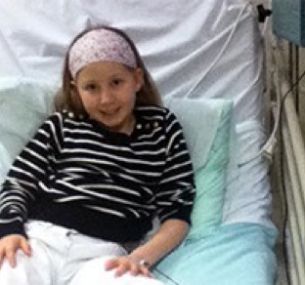 She had a few blood and platelet transfusions, but nothing stopped her from going to school. Things were going well again until about March when Olivia just wasn’t quite herself. She was quieter than usual, had developed a foot drop, and sometimes the left side of her face seemed to droop. The doctors did lots of tests but could find nothing wrong and the MRI’s were still stable. She had blood tests to check her pituitary function and was found to have hypopituitarism. She started on treatment for this, but still wasn’t herself. She seemed to have lost her sparkle and had a few episodes of severe headaches and vomiting. Her vision seemed to be worsening and she was increasingly unsteady on her feet. In July 2013 it was decided for Olivia to have a lumbar puncture. Test results unfortunately showed malignant cells. After discussions with Olivia’s consultant it was clear that despite MRIs being stable, something else was going on and cure was no longer the aim of treatment. We decided on a further treatment plan to try and extend Olivia’s life. 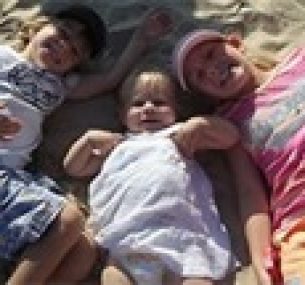 The way things were progressing Olivia’s consultant felt that without treatment it was estimated she would have around 4-6 months to live – with treatment lasting approximately 12 months. 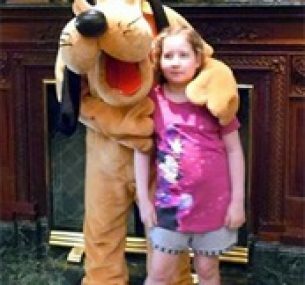 Olivia’s school funded a trip for us to Disneyland Paris. We had an amazing time and Olivia’s wish to take her younger sister to Disney was granted. The day after we came back home, on 23 July 2013, Olivia was admitted to Alder Hey for insertion of an Ommaya Reservoir. This was for the new treatment protocol so that the chemo would go straight into her Cerebrospinal fluid (CSF). The morning of the procedure she wasn’t quite herself. She never seemed to fully recover from the anaesthetic and had become incontinent. Over the next couple of days she was back on her feet, but still incontinent, and not herself at all. Four days later she became unresponsive. At this point we were told there was nothing more they could do. We were advised to sign a Do Not Resuscitate order (DNR), which we did. We were transferred back to our local hospital, to Olivia’s favourite room, for end-of-life care. Olivia amazed us all, entering the ambulance unresponsive and gradually getting more alert as we got closer to home. By the time we arrived at our local hospital she was trying to sit up. The next day she was wandering around the ward after her beads of courage! We decided at this point to take Olivia home and spent the best weekend together with Olivia and her brother and sister, laughing and joking. She gave us so many lovely memories. Over the next few days Olivia began to sleep more, until the Thursday when she woke for the last time. I got the chance to tell her how much I loved her and how brave she was. She used all her strength to reply that she loved me too. Olivia slept peacefully after that until late Saturday night, 10August 2013, when she slipped away peacefully surrounded by family, her favourite nurse Holly, and our priest. This was less than four weeks from the prognosis of 4-6 months we’d been given if she went without treatment. She was an amazing, inspirational young girl who never complained as long as she could be at school with her friends, the teaching staff and the teacher with whom she formed a very close bond. She showed us the true meaning of courage and touched the lives of all that met her or even just knew of her.